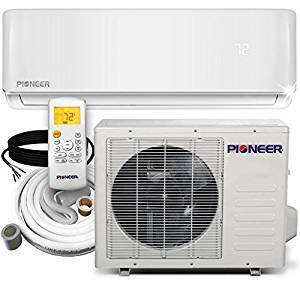 If you need an efficient wall air conditioner, then PIONEER Mini Split Air Conditioner is one of those choices that you need. This air conditioner is efficient and works perfectly for homes, churches, and offices. The cooling capacity for this awesome PIONEER Mini Split Air Conditioner is 12, 000 BTU/H and the conditioner also comes with 17.5 SEER efficiency making it suitable for its work. PIONEER Mini Split Air Conditioner is a 2-in-1 air conditioner and works both to cool and to heat. It also work as an air conditioner inverter and when it is cold, it can heat the air to bring about warmth. When it is hot, it can bring about cooling and that is one of the advantages of owning this PIONEER Mini Split Air Conditioner. In that case, the heating capacity is 11, 800 BTU/H and with the 9.0 hspf efficiency. If you need an energy-efficient and easy to handle wall mount air conditioner, then Friedrich Chill Series CP12G10B Window Air Conditioner is the right choice for your needs. The addition for this wall or window air conditioner is that it comes with programmable timer and hence making it easy to set whenever you want to operate. The money-saver setting is useful when it comes to reducing or cutting electricity bills or costs. Being one of the best wall mount air conditioners, there is much to enjoy about it. 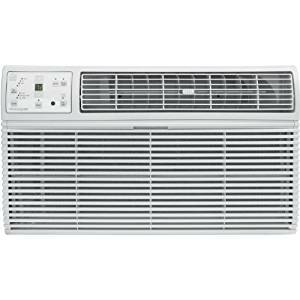 Friedrich Chill Series CP12G10B Window Air Conditioner features Auto Air Sweep feature and cools the room evenly. When it comes to other specifications, this wall air conditioner comes with 12,000 BTU cooling capacity and that makes it suitable for large rooms of up to 550 sq. ft. in size. The other good thing with this device is that it can be installed either as a window air conditioner or as a wall air conditioner. Can serve a large room of up to 550 sq. 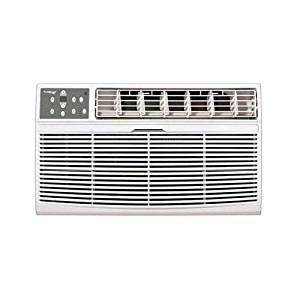 ft.
Koldfront WTC14012WCO230V is one of the best wall mount air conditioners and is only for cooling. It is the best in that it works efficiently for rooms with sizes between 550 and 700 sq. ft. Koldfront WTC14012WCO230V is, therefore, the best through the wall air conditioner that comes to give you the solution you need for your large room. When it comes to the cooling capacity, this conditioner comes with 14,000 BTU, and SEER efficiency of 9.4. The other specs that you need to note is that this wall air conditioner comes with 14.5″ H x 24.2″ W x 20.3″D dimensions and 78.1lbs of weight. In addition to the features that we have mentioned, this wall mount air conditioner comes with energy saver, digital control display, 24 hour timer, and remote control among other features. Frigidaire Through-the-Wall Air Conditioner is a unique air conditioner that comes with temperature sensing feature and hence making it one of the best wall mount air conditioners. Frigidaire Through-the-Wall Air Conditioner is suitable for rooms of up to 550 sq. ft. in size. Therefore, if your room does not exceed the same size and you need the best wall mount or through the wall air conditioner, then Frigidaire Through-the-Wall Air Conditioner is the choice you need to check out. 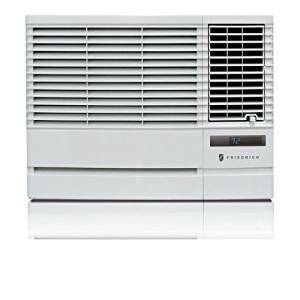 Frigidaire Through-the-Wall Air Conditioner as we have said is truly one of the best wall mount air conditioners and with pack of features that makes it efficient and effective as we have mentioned. Frigidaire Through-the-Wall Air Conditioner also come with electronic controls and hence you select the option that you want just by the touch of the button. The other thing to mention with this awesome through-the-wall air conditioner is that it features dehumidification of 3.3 pints per hour. Coverage area of up to 550 sq. ft. This wall air conditioner is for both heating and cooling. Therefore, if you are looking for an all-in-one air conditioner, then Koldfront WTC12001W through the Wall Air Conditioner is the choice that you have to pick. It is an efficient choice that works perfectly for heating and cooling. The other features to note is that the conditioner comes with dehumidification capacity of approximately 30 pints/day, 24-hour timer, three fan speeds, and 4 operating modes. On the other features, this worthwhile air conditioner comes with 12,000 BTU cooling capacity, and 10,600 BTU heating capacity. In more exact terms, this air conditioner comes with the capacity to cool up to an area of 550 sq. ft. and to heat to a capacity of 450 sq. ft. among other features. 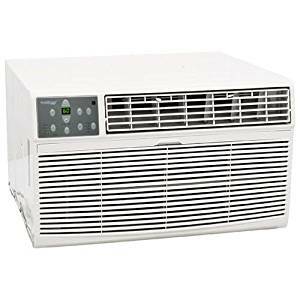 Therefore, this Koldfront WTC12001W is one of the best wall mount air conditioners that works perfectly and efficiently for both heating and cooling. Cools up to 550 sq. ft. and heats up to 450 sq. ft. If it’s for cooling, you need to note the cooling capacity that comes with the air conditioner so that you can match with the size of your room. This is recorded in BTUs and you need to check the same to know that and also the coverage area. Since they come in different capacities, you can have the right match that would be suitable for your room size. Are you interested in saving energy for less electricity bills? If that is the case, then you should go for the energy efficient choice that can save on power. Some even come with energy saving features and that would be beneficial when it comes to the costs of electricity. Do you have the option to control the noise? Or to reduce so that you don’t get disturbed by the amount of noise that would otherwise be associated with the conditioner? Here, you need to check on the level of noise and whether you can control the same so that you can stay assured of what you are buying. About installation, you need to check whether you have or the product comes with everything you need for installation. You also need to check on how simple or easy the installation is so that you can plan if some expertise is needed for the same. You should note that some air conditioners come with all-in-one features that make them useful for cooling, heating, dehumidification, and other functionalities. Some also work as air conditioner inverters and, therefore, you need to get to know whether the kind of your conditioner you want to buy comes with the functionalities that you want or not. That way, you will be making the right choice.